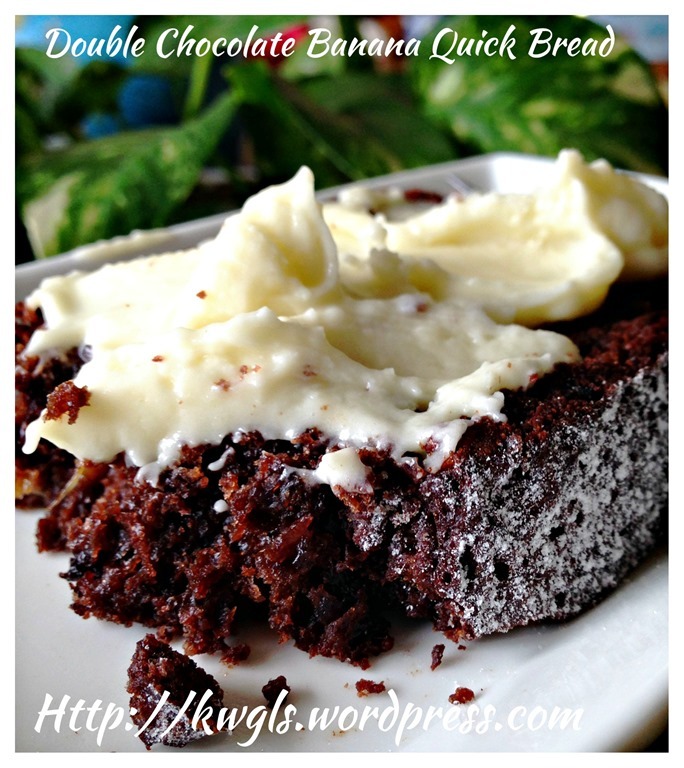 I have never bake anything with chocolate and banana combo… But apparently it is very popular among members of Facebook Groups. I am also rather curious about the taste of this combo.. 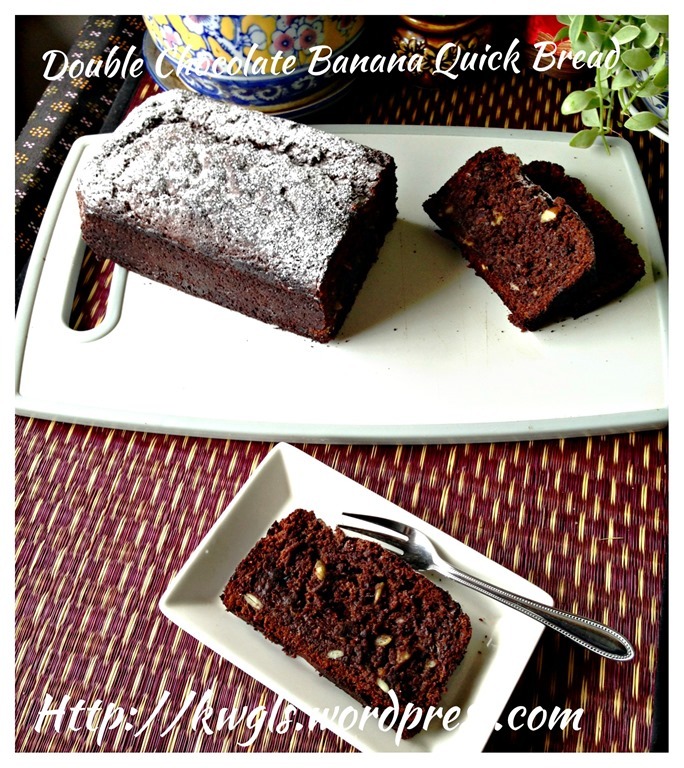 I cut a piece and gave the rest to my relative… Not that I do not like the quick bread but I have intention to prepare it as a gift… It is a very moist cake as both banana and chocolate are moisture retainer.. 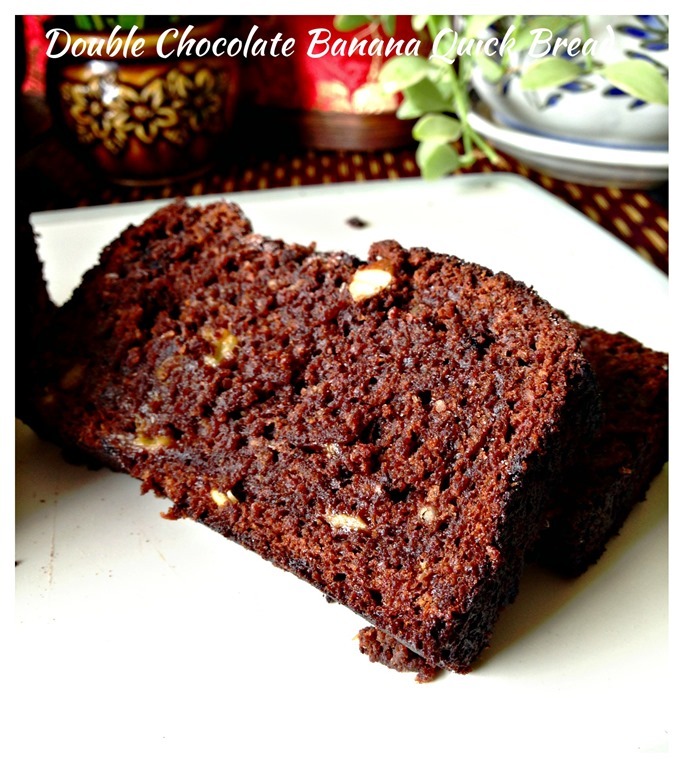 The small pieces of nuts give the entire piece of quick bread something to chew… The quick bread have both strong aroma of chocolate and banana..
Pre-heat the oven to 165 degree Celsius. 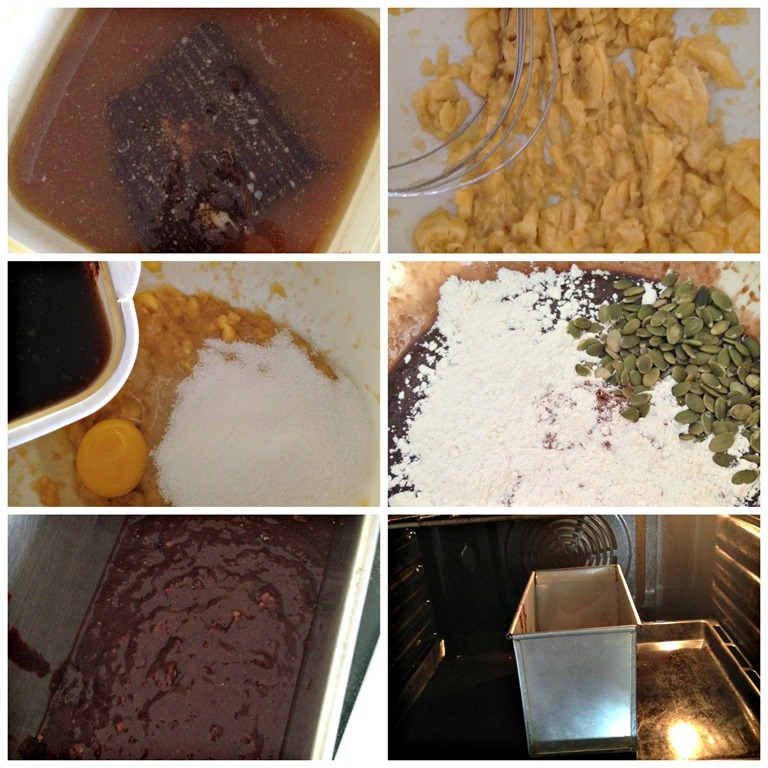 and lightly greased a 9”x4”x4” pull man tin or baking tin of your choice. 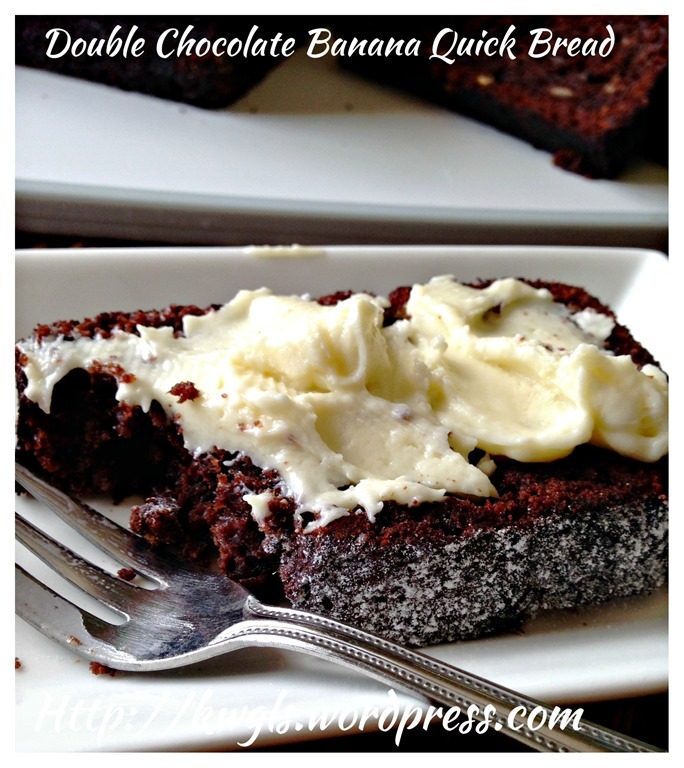 Melt the butter in a microwave for about 1 minute and the chocolate for 30 seconds. Stir until well mixed. 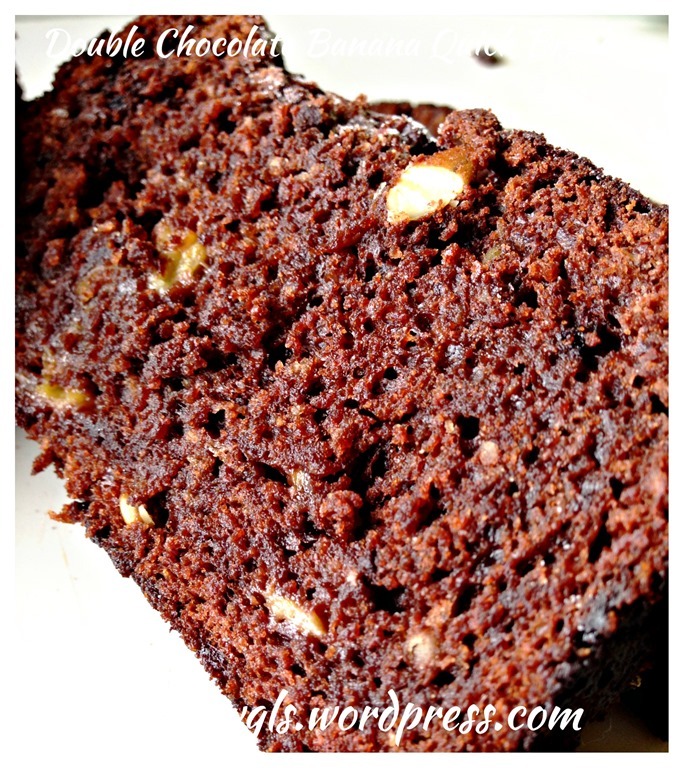 You can also heat the butter and chocolate over the stove under low heat until both melt. 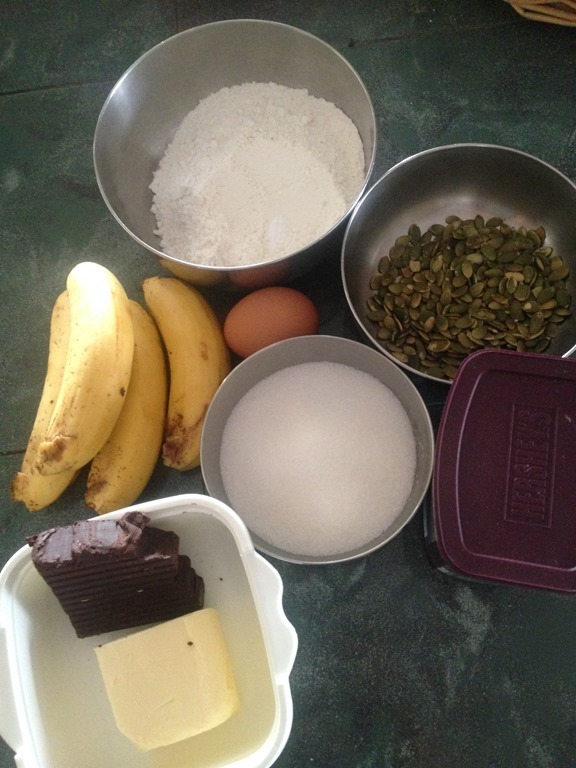 Mash the banana, add egg, the butter and chocolate mixture, stir until well combined. Add sugar, nuts and sift in the baking soda and self raising flour. Use a spatula to fold until well combined. Transfer the batter to the greased baking tin and bake in the pre-heated oven of 165 degree Celsius for about 45minutes or until a skewer inserted comes out clean. Cool completely before cut for serving. Do give it a try. 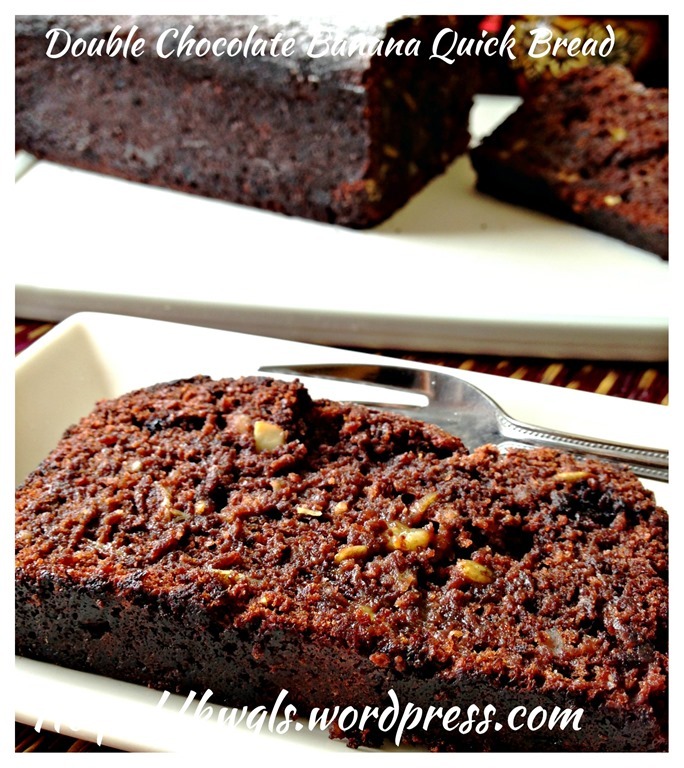 An easy peasy recipe with great taste.. 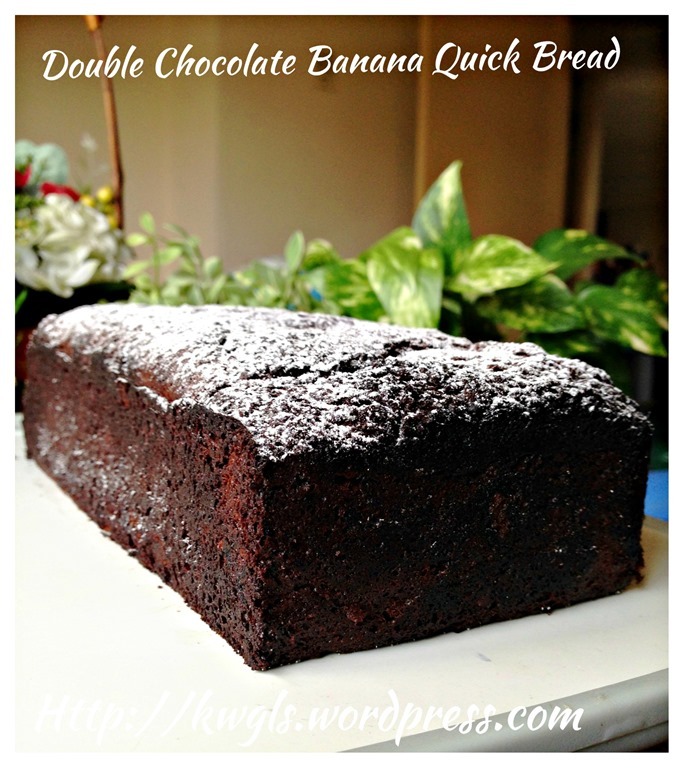 It is a piece of moist and aromatic quick bread. Hope you like the post today..Cheers and have a nice day.. 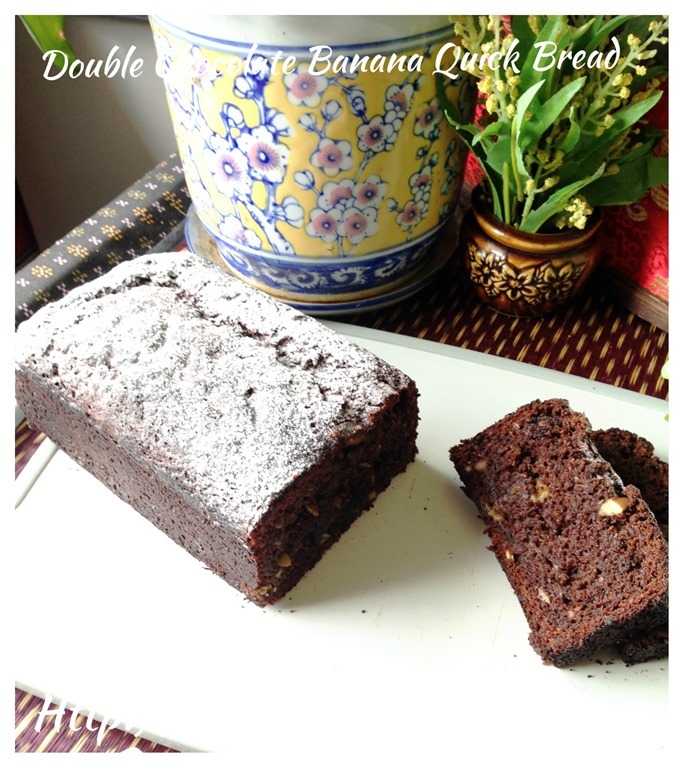 This entry was posted in Breads and Pizza, Cakes and cookies, Food Preparation Series and tagged banana quick bread, chocolate banana quick bread, GUAI SHU SHU, Guaishushu, kenneth goh, postaday, 巧克力香蕉快速面包. Bookmark the permalink. 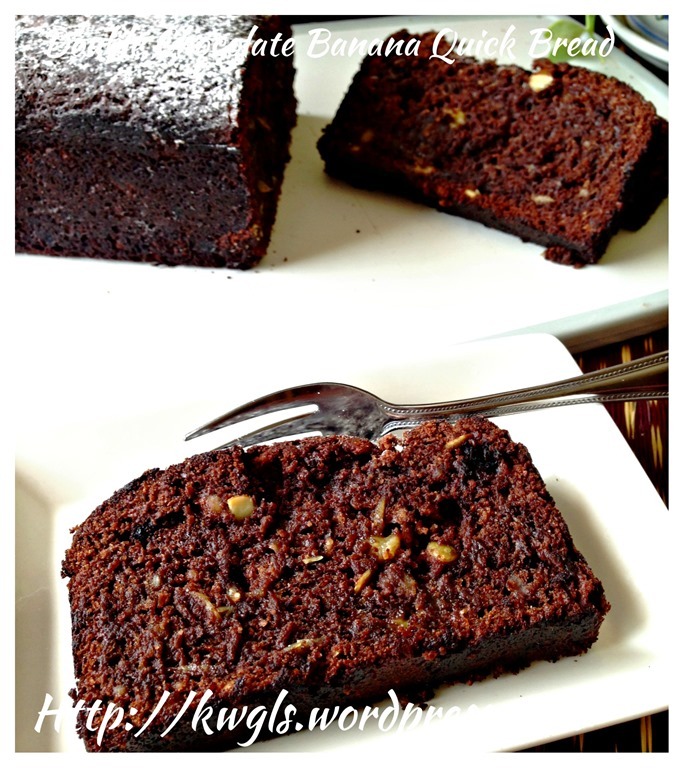 Dear Kenneth, tried your recipe and its realy easy and manage to get the soft and moist taste. 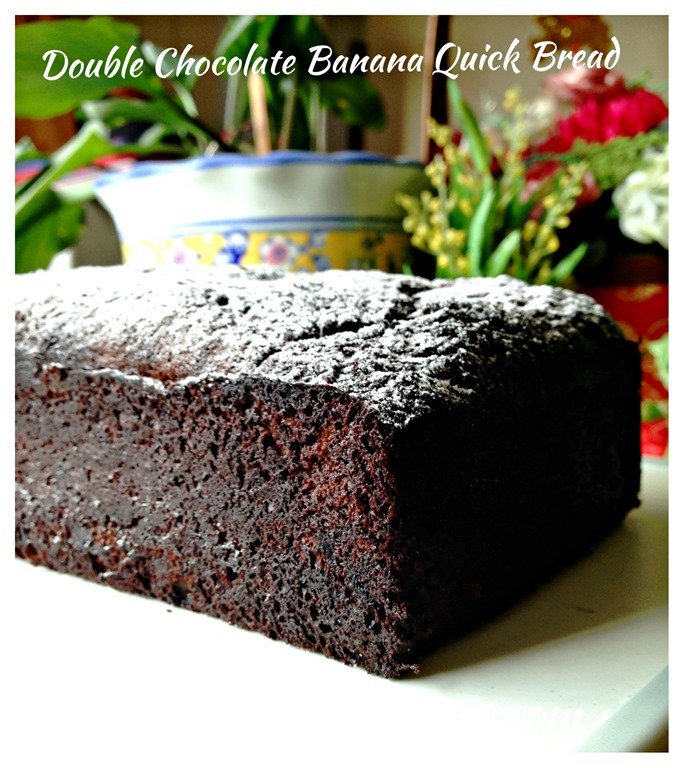 Its has the banana’s flavor and the dark chocalate’s after taste is bitter sweet ( as i don’t hv semi sweet ) i baked in cup cakes as i don’t have a loaf tin. Really worth a try ! Happy to hear that you like it..